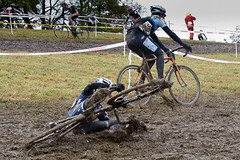 Granogue ‘Cross took place October 17, 2009, in Wilmington, Delaware. It is up for debate whether the race was more epic or biblical. Rain, mud and cold ruled the day. To succeed in this race you needed to be able to do two things well: drive your bike and run in 6-inch deep mud. An all too familiar sight at this year's Granogue. The video matches the conditions. A little bit raw and distorted. I did a bit of editing to make sure the ten-minute clip includes a full lap. There are also a couple spots in which the picture is obscured by rain on the lens. It may not look pristine but it gives a pretty good depiction of the limited vision you actually have in a race in these conditions. Music for this round is courtesy of Exotic Fever Records. Check these guys out. There is something for everybody on this label. Featured here we have Pash, Kathy Cashel, 1905 and Respira. As always, if the video isn’t streaming smoothly, click on the red HD button that appears at the bottom right of the screen after you click on play and it should stream faster. Sweet. BTW, sorry if I gave you a bunch of s*&% going down the hill after getting off the tarmac at the start. I was getting whipped by the bushes and couldn’t move right – collected the World’s Longest Splinter in my hand! Didn’t realize how crowded it was until I saw that video. Awesome video. Wasn’t there, but it definitely confirmed what I heard! Thanks for cutting out the part of the video where you pass me for once. I appreciate it so much, that I’ve been trying to decide between buying you some RainX or a small windshield wiper for your camera. Nice it gives the others the perspective of this great race, nothing quite like it, you ran passed me as I was “stumbling” through the uphill run through the bamboo section. Gnarrly vid! I’m the cat in orange & blue you couldn’t shake until the end. thanks for posting.